What is Instant Fluency? Is it possible to bypass the years of struggle, and engineer that single moment when a new language clicks and communication becomes natural? Crack the Code on Fluency: When you learned your first language, as a 2-year-old, did you memorize grammar rules? Why can t you learn your new language that way? 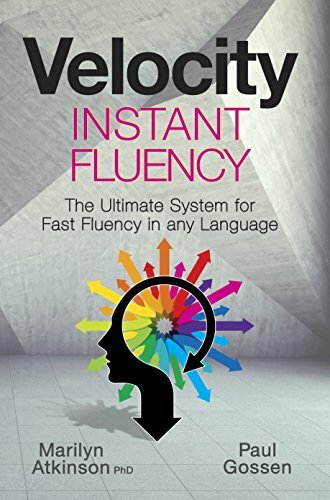 The Ultimate System for Fast Fluency: Velocity is not a single tool or idea. It is a complete system that has been tested and proven with thousands of people over the past 20 years. Model the Man who Speaks 42 Languages: In 1985, Powell Janulus was entered into the Guinness Book of World Records for fluency in 42 languages. Powell could often demonstrate beginner fluency in any new language with just a few hours of practice. The Velocity team spent 7 years researching his ability and developed the model that everyone is using for accelerated language learning and instant fluency. Fun: Language fluency is like eating ice-cream... If you re not having fun, you re doing it wrong. Your accelerated learning capacity will not turn on unless you are relaxed. Fun is the best way to get there. Easy: There is always an easier way, you just have to find it. Your learning system loves multilayered games. Take a kid s game like hopscotch. This includes counting, singing, melody, rhythm and repetition. This is a peak learning activity. Velocity turns the most difficult grammar rules into easy games. Fast: The Fast Track to Fluency: Each of the 12 Velocity ideas and tools opens a door to fast fluency. Together they form a comprehensive system. Take the top two tools in Velocity, Intoning, and Encharting and play with them every day for 30 days. You will experience a breakthrough in fluency. Is there a fast and easy way to language fluency? In 1985, Powell Janulus was entered into the Guinness Book of World Records for fluency in 42 languages. He could often show beginner fluency and comfortably converse in a new language in just a few days. How was this possible? Did he have a unique gift, or was his ability something anyone can do? Marilyn Atkinson, Ph.D., spent 7 years researching Powell s unique abilities and developed a system that would allow anyone to accelerate their language learning. Paul Gossen refined this into the Velocity model for Instant Fluency in any language. Velocity is based on an advanced experiential learning methodology that embeds sophisticated accelerated learning approaches into simple ideas, actions and games. This methodology has been refined over 20 years by Marilyn Atkinson and has been intensively developed by Paul Gossen. The process has been tested by everyday people around the world and is supported by a community of raving fans. What if you could Learn a Language like a Two-Year-Old? Velocity Language Learning shows you how to stop struggling with traditional language learning and step back into your natural learning system. What if you could emerge into your new language in a completely automatic way, without any hard work. Imagine being able to confidently talk with anyone anywhere in the world. Imagine being able to instantly communicate in any language in just a few days. Welcome to Velocity. Break the Language Barrier: How is it possible that most humans cannot communicate with most other humans? In today s world of free communication and instant travel, this barrier of language is unacceptable. Easy Language Learning is a basic human right. To create peace on earth by making easy language learning a basic human right. If you have any questions about this product by Velocity Learning, contact us by completing and submitting the form below. If you are looking for a specif part number, please include it with your message.